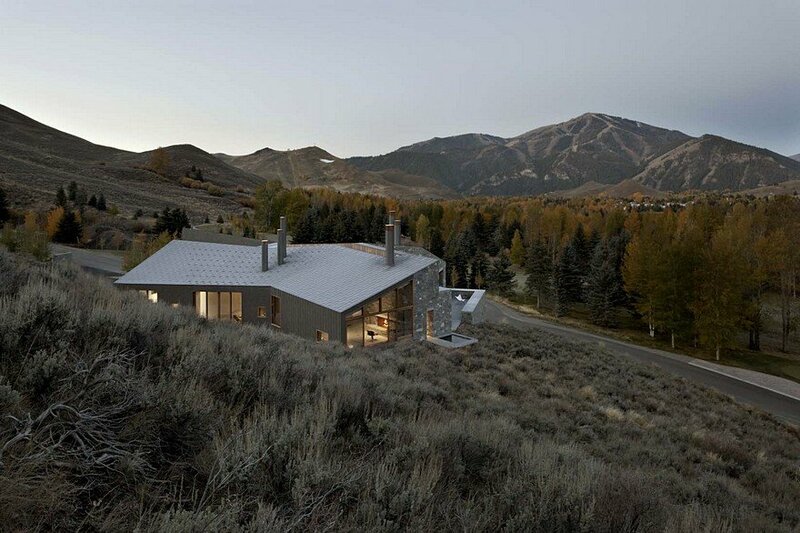 Designed by Rick Joy Architects, this all-season home occupies a 1.5-acre, west facing site in Sun Valley, Idaho. 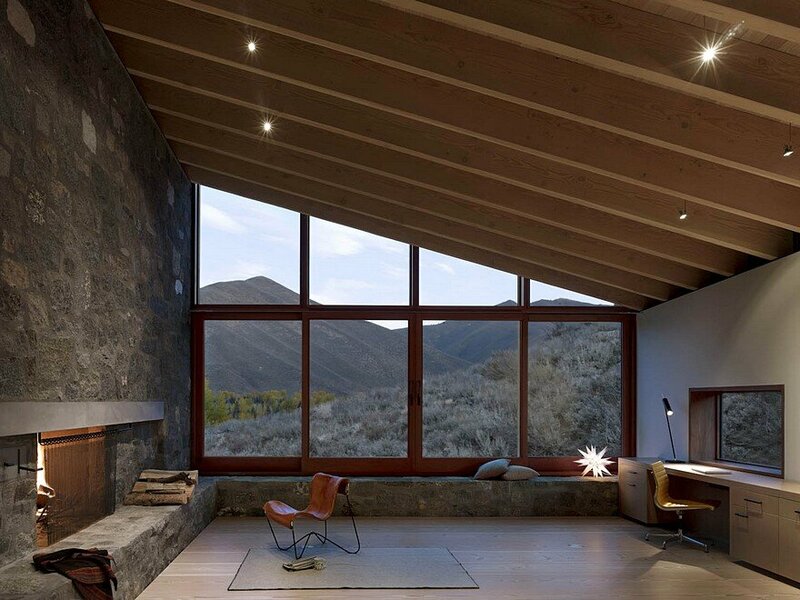 Carefully sited on a steep hillside, the house was strategically positioned to maximize visual exposure to nearly 360-degree views and minimize disturbance to the native landscape. 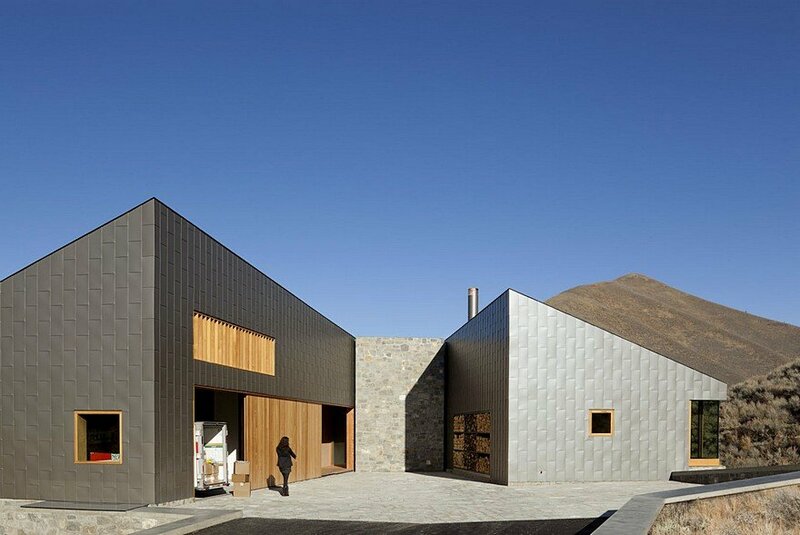 The angular entry drive, which was derived from the architectural forms, slices through the hillside between the street and the house, accentuating dramatic views to the nearest mountain to the east while delivering cars to a stone-paved arrival court. 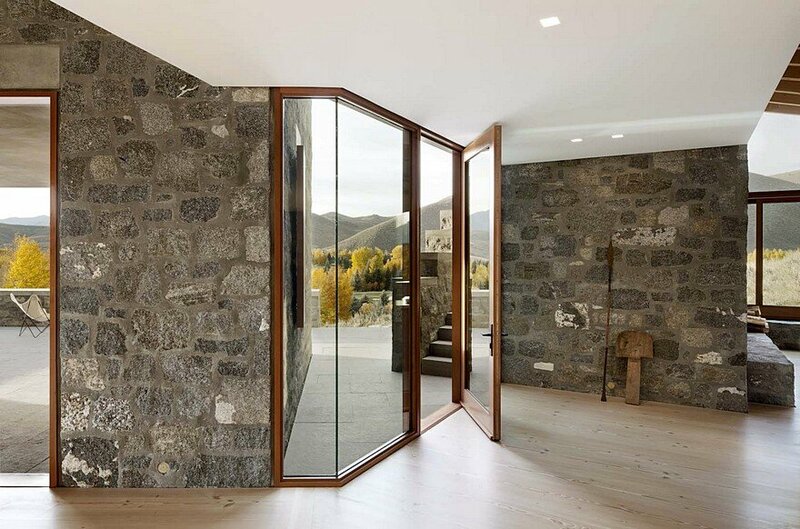 Several terraces extend indoor spaces to the outside and offer particular, framed views of the nearby mountains. 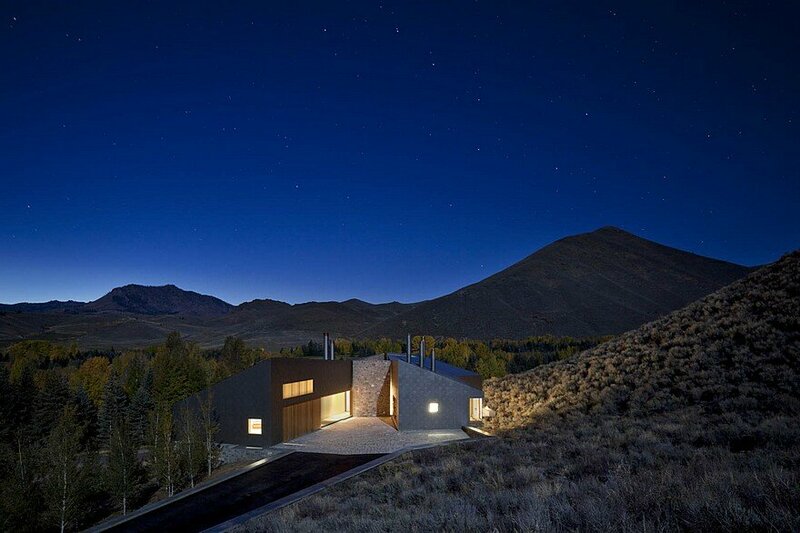 Throughout the design and construction process, care was taken to preserve the native sage that surrounds the home. 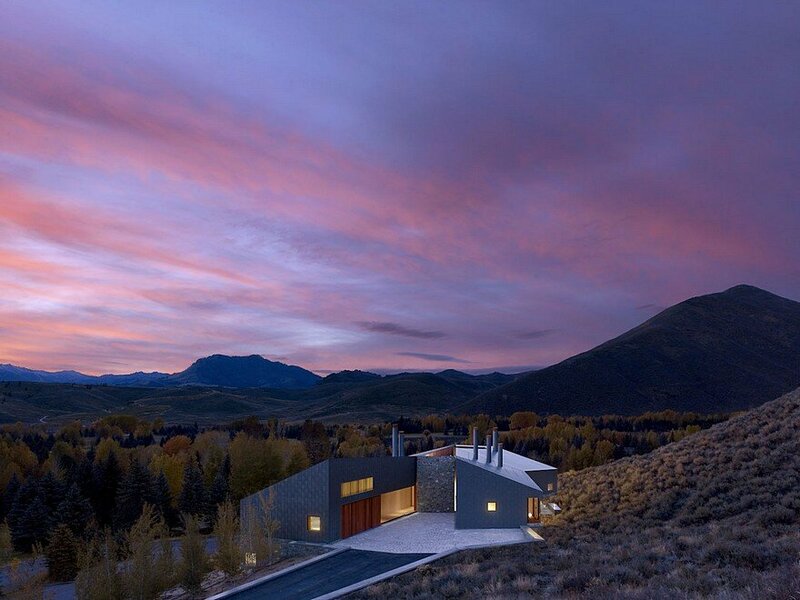 Rick Joy’s Sun Valley House has two wings, with roofs raked in opposite directions. 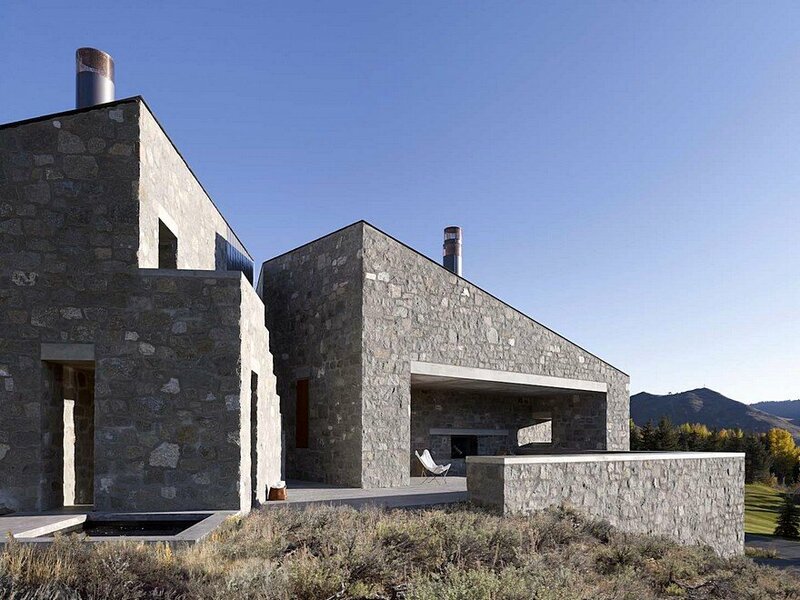 These wings are angled and crooked so that its rooms capture the best views of the rugged landscape. 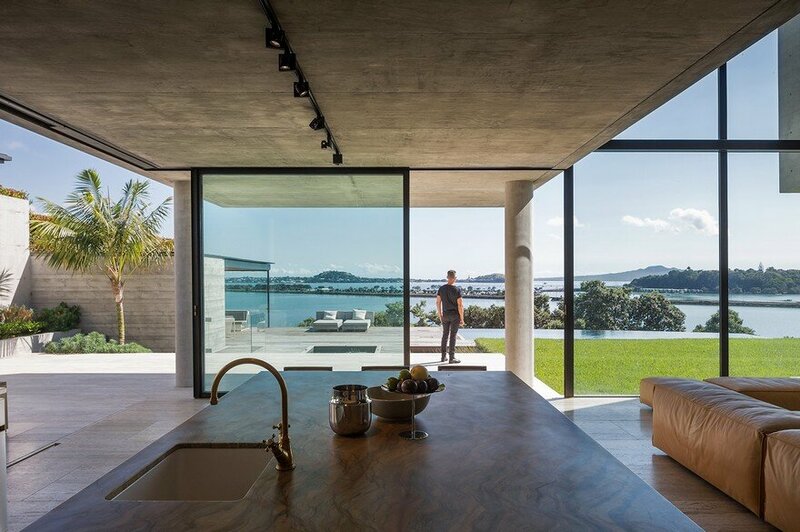 The configuration also creates a sheltered entry court at the southern end and provides a ground-level terrace with a stair to a rooftop deck at the northern end. 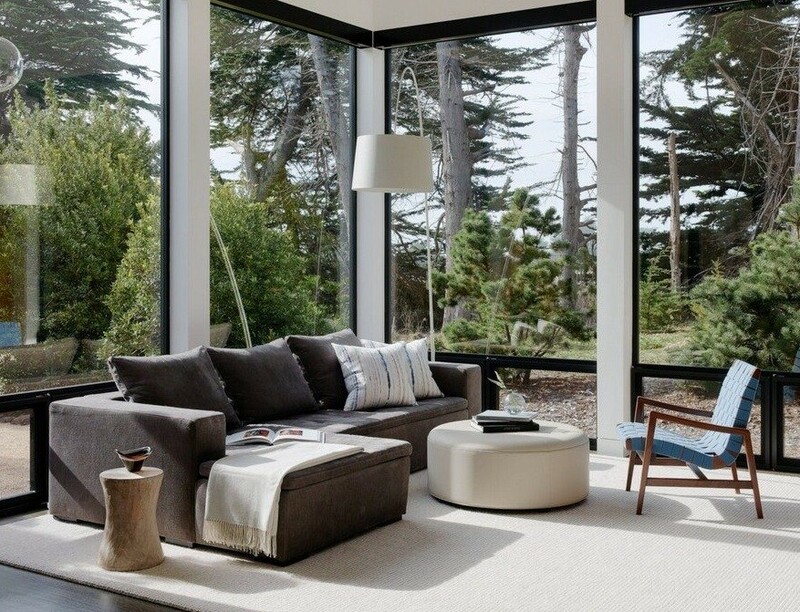 Most of the windows frame far-off vistas. 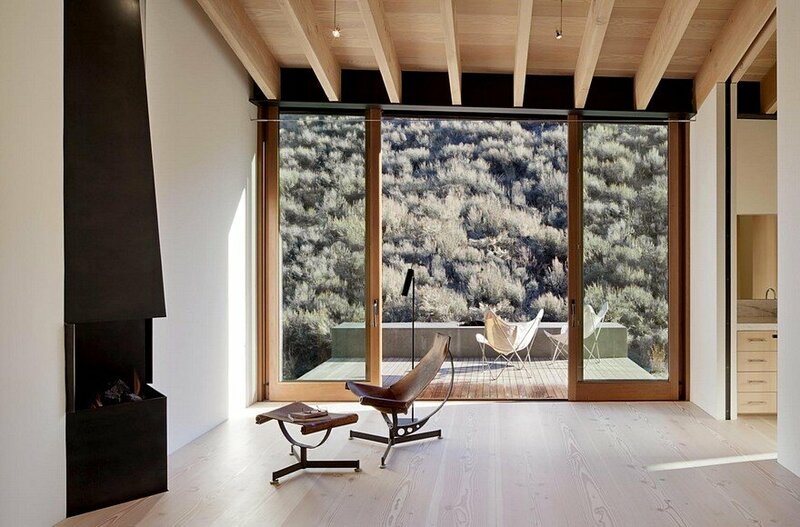 The exception is the sliding glass door in the master bedroom. 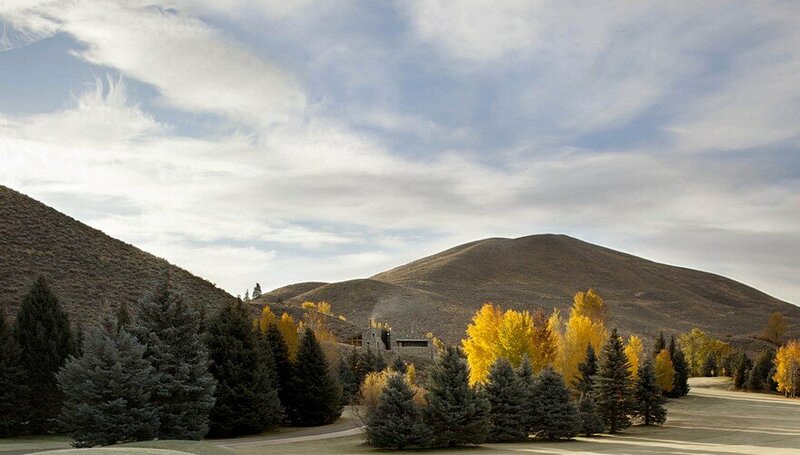 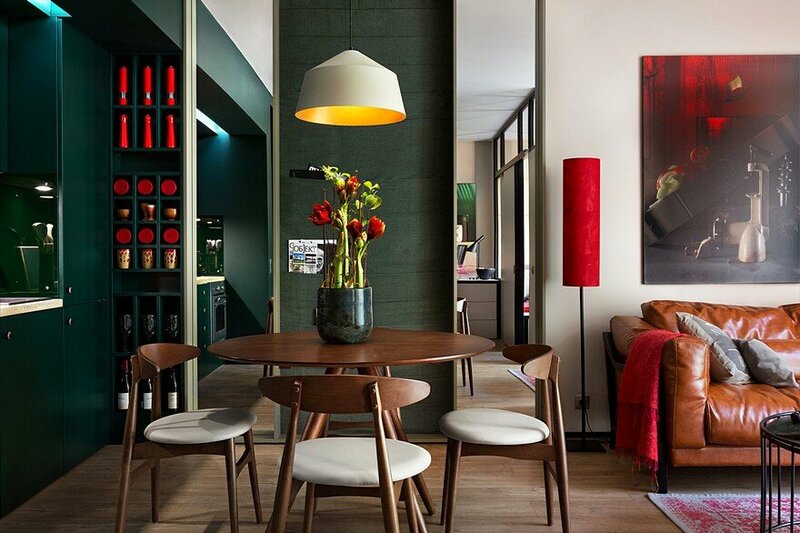 It offers a view of a brush-covered hillock that rises just a few feet away. 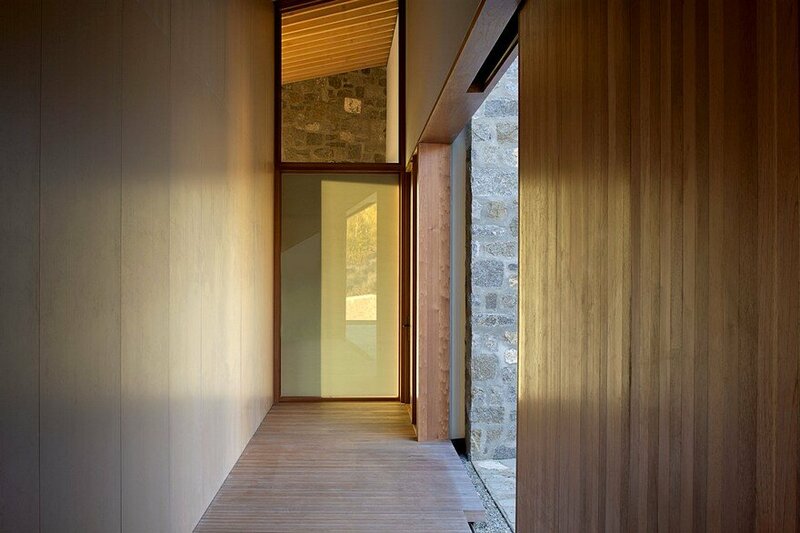 The rafters and the flooring, both of Douglas fir, run in the same direction and lead the eye outside. 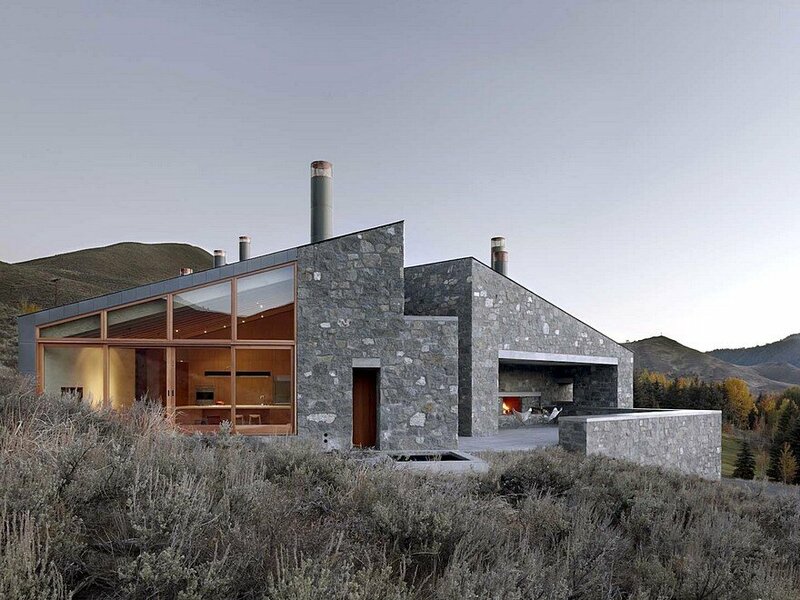 Split the volume along the gabled roof ridge to create two wings: the western one is two stories with its lower level partially submerged in the sloping terrain, and the eastern wing that is single-story. 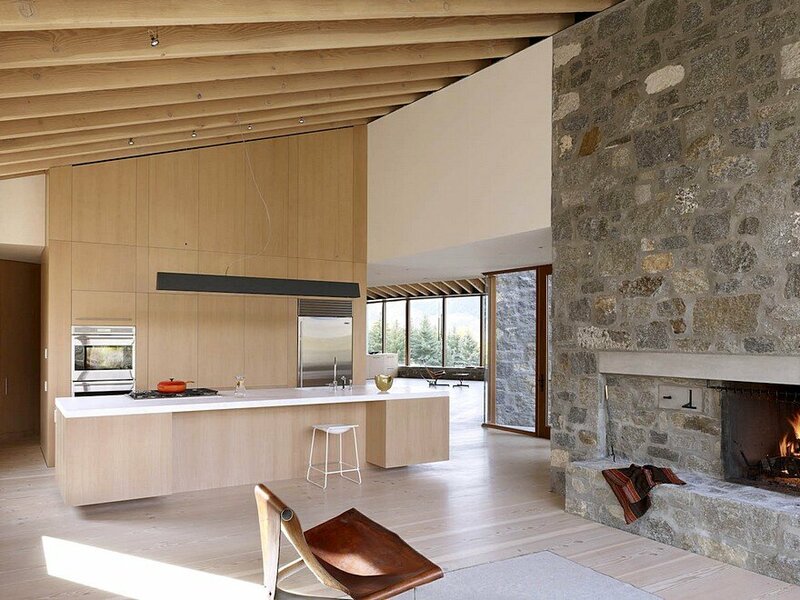 In the house’s two main living spaces, the exposed rafters soar as high as 20 feet. 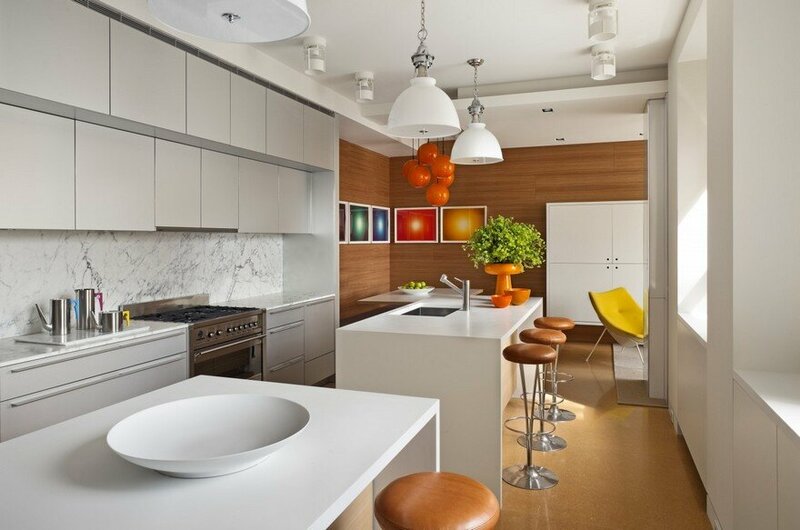 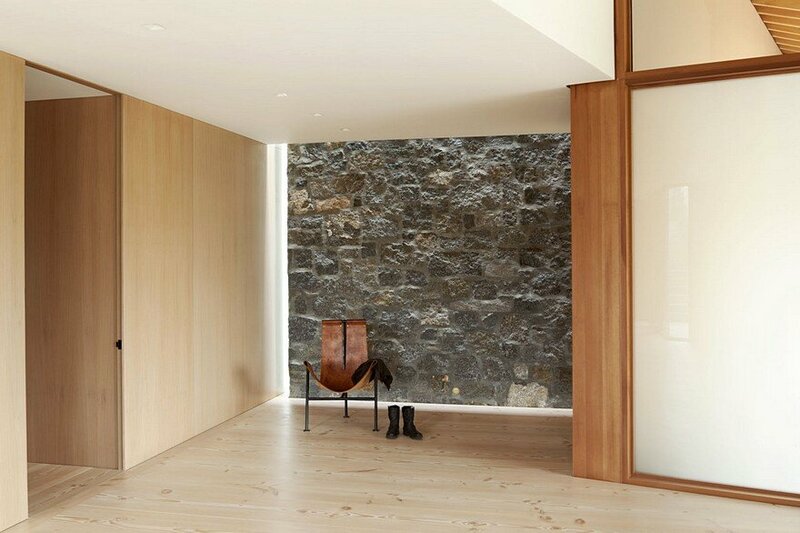 A much lower (9 feet tall) drywall ceiling establishes an intermediary circulation zone, where the two rooms’ geometries meet. 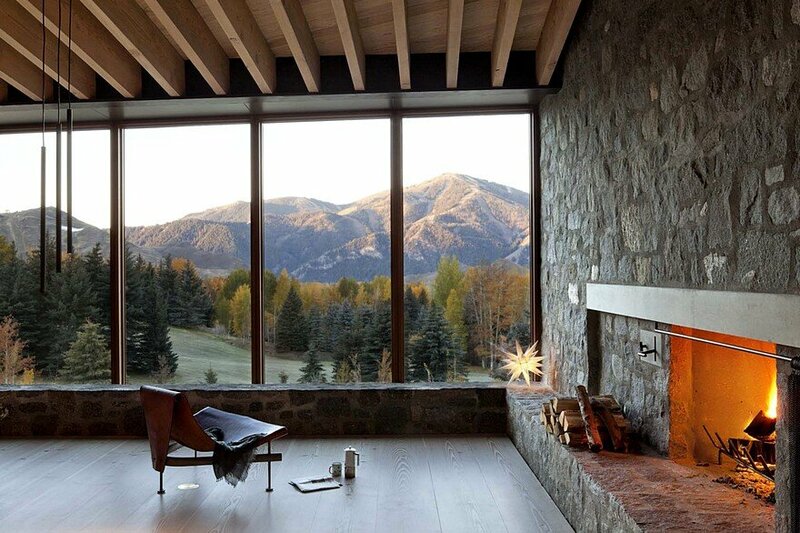 The Sun Valley house has the best vantage points for taking in the rugged landscape, from the kitchen and dining room, they are able to appreciate a set of sawtooth-shaped peaks. 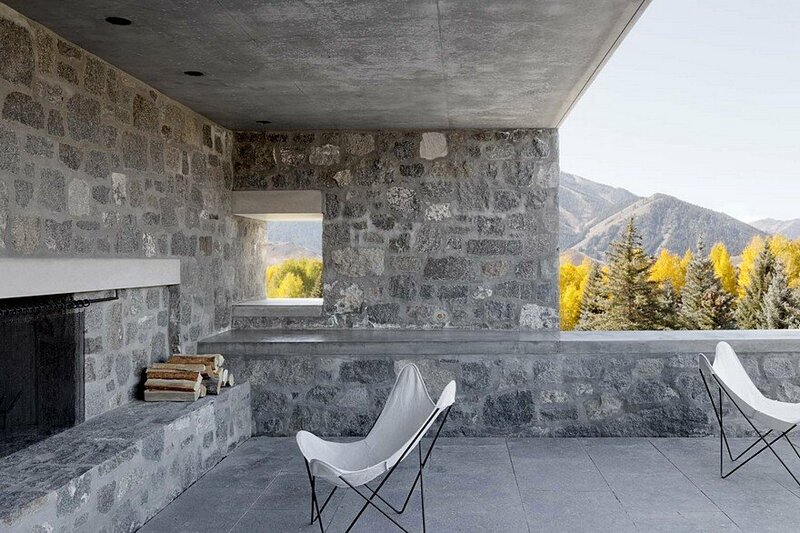 Much of the Sun Valley house is enclosed in masonry walls, exposed inside and out, made of a local granite from southern Idaho. 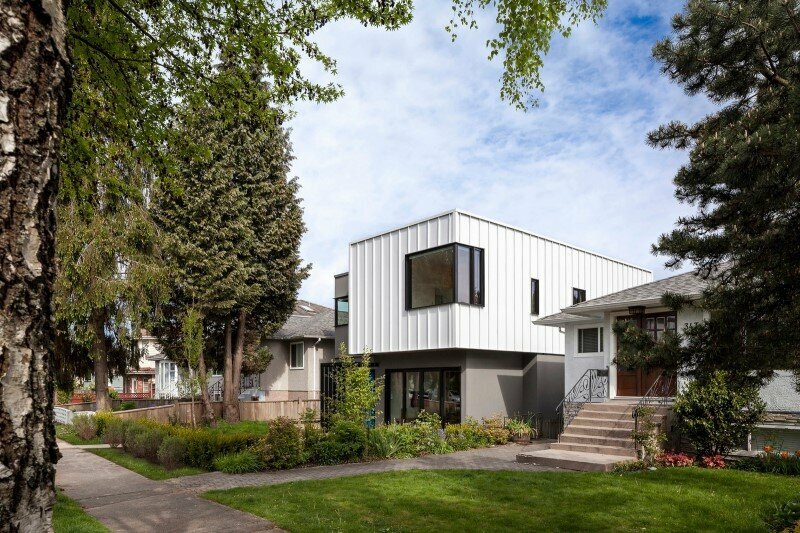 The roofs and remaining walls are framed construction, clad in a rainscreen system of interlocking steel panels.